Planning our character meals for the Disney World trip, I was keen to avoid the princesses a little more and see characters that we didn’t spot last time. 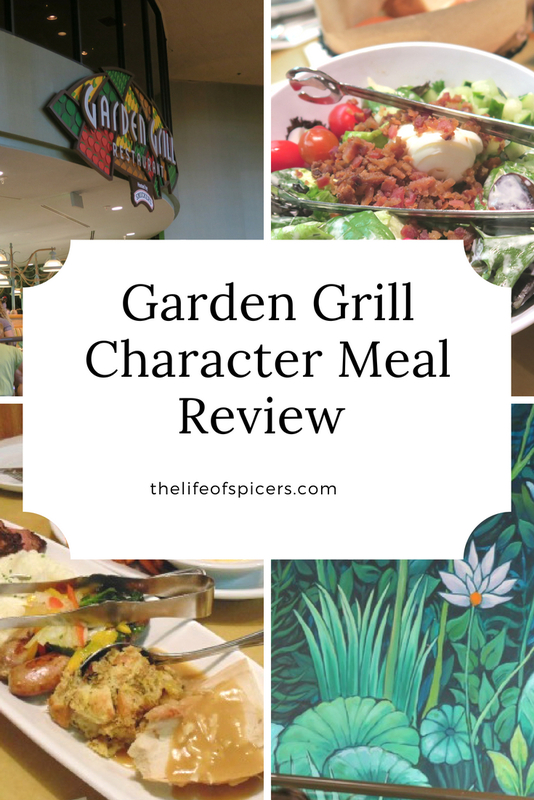 I also spent quite a lot of time perusing the menus before I booked anything and I liked the sound of the Garden Grill Character Dinner, one of the Epcot character dining restaurants. I felt it was food that everyone would enjoy and it is served family style meaning that we could eat as much or as little of each thing as we wanted. Garden Gill is located in Epcot inside the Land Pavilion. On the first floor as you go in, you can’t miss the large signs on the upper deck. Our reservation was for 6pm, we arrived fifteen minutes early and were shown to our seats on the dot of 6pm which was great. The restaurant also stood out to me as it’s a slow revolving restaurant, taking you through different lands as you eat. I knew that there are two levels to the restaurant, the lower deck has booths which you can see straight out into the lands below (which is also part of Living with the Land ride), and an upper deck that is laid out as tables. We were seated on the upper deck which first of all I was slightly disappointed at, but in actual fact it meant we didn’t get people walking pas our table all the time and we were still able to see everything. 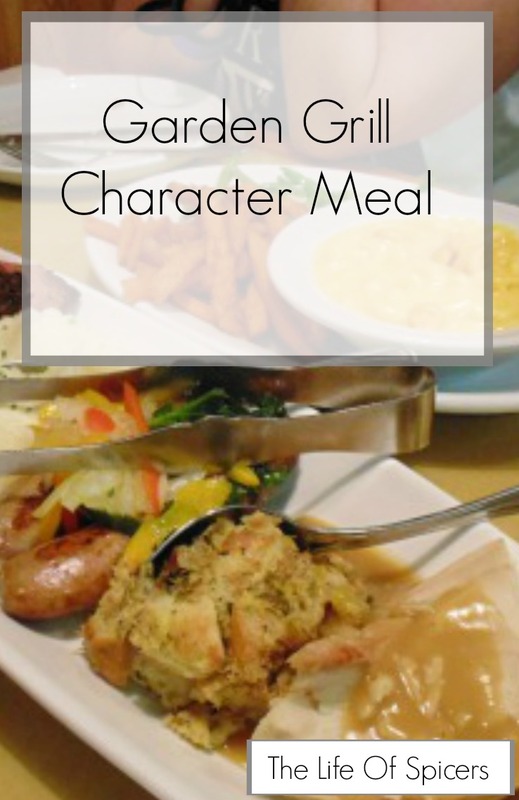 Garden Grill character dining is served to you family style as mentioned above. 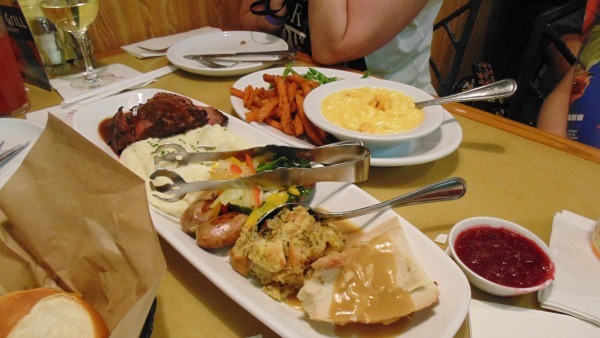 It’s a set menu that everyone gets including meats, mashed potato, vegetables, macaroni cheese and sweet potato fries. 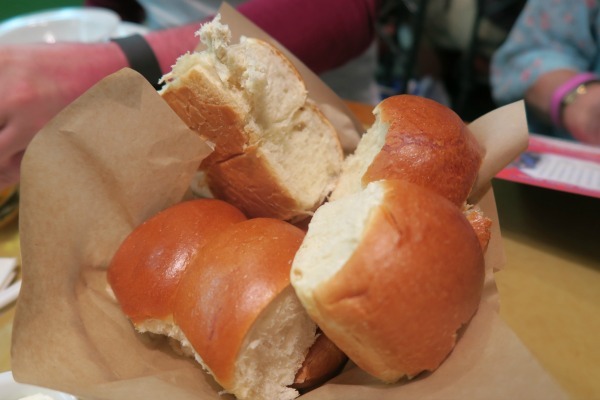 Before you get your main course however you are served warm rolls and butter before getting a large bow of salad. Anything that you want more of you can ask your server and they will bring you more. Our table was for four, and we received more than enough bread rolls for us to start. Crispy but soft bread roll with a lovely orange blossom honey butter. We went through the butter very quickly it was that nice, but of course we could have asked for more should we have wanted it. 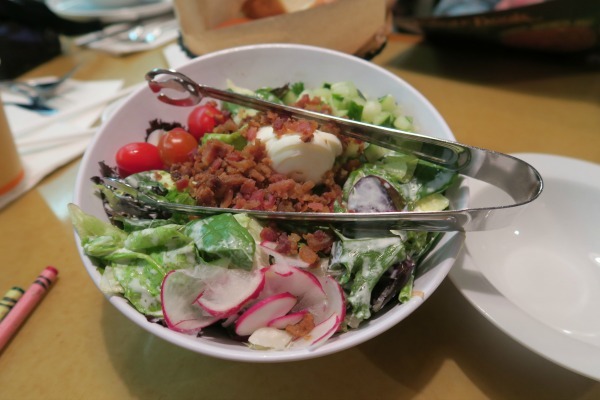 A farmers salad arrived shortly after the rolls which contained green leaves, radish, tomatoes, crispy bacon bits and the most amazing ranch dressing any of us have every tried. There was nothing left in this bowl by the time we had all delved in. We contemplated getting more it was that nice, but we knew our main platter of food would be arriving shortly. What Characters Are At Garden Grill Dinner? During your meal the Garden Grill characters will arrive at your table which include Chip, Dale, Farmer Mickey and Pluto. We were advised which characters would arrive as we were seated. It wasn’t long before Chip arrived, and I have to say he was the highlight of our meal for a variety of reasons. We saw him more than once, he arrived with Dale at one point, and he tried to sign Miss A’s autograph book twice which was hilarious. A great interactive character. Do you get confused between Chip and Dale? The difference between chip and dale is that tip has a black nose. An easy way to remember this is to think of a chocolate chip cookie. How Long Is Dinner At Garden Grill? When we were first seated, our view was the farmhouse, and we wondered how long it would take the restaurant to rotate completely around the lands. Our guesses were correct when we decided that by the time we had eaten dessert we would be back to where we started, and we were right. The restaurant took approximately an hour to completely rotate. What I liked about Garden Grill was you were in control of how quickly you had your meal. The salad and bread arrived quickly, however we were asked whether we were ready for our main course before it arrived with us which was nice. There was so much food included in your harvest feast including turkey with gravy, beef cooked quite rare, sausages, stuffing, cranberry sauce, green beans, sweet potato fries, mashed potatoes and macaroni cheese. The turkey disappeared quite quickly before Hubby could try it and the mashed potato not long after so we asked for more of both expecting a small plate, but not a large amount of mashed potato and lots more turkey slices arrived quite quickly. The platters didn’t look like a huge amount of food on first inspection but there was so much we struggled to finish it all between us all. The only thing we found was that the table was slightly too small to house the food, our plates, drinks, autograph book and have enough room to eat, but that’s a minor flaw. As I mentioned we saw Chip more than once and he was great. Dale followed after Chip quite quickly, but we waited ages to meet Pluto or Mickey. We spotted them doing the rounds but we were eating dessert before they came to say hi. When dessert arrived, I’m not sure we really had a lot of room left for it, but I was determined to eat a small amount. 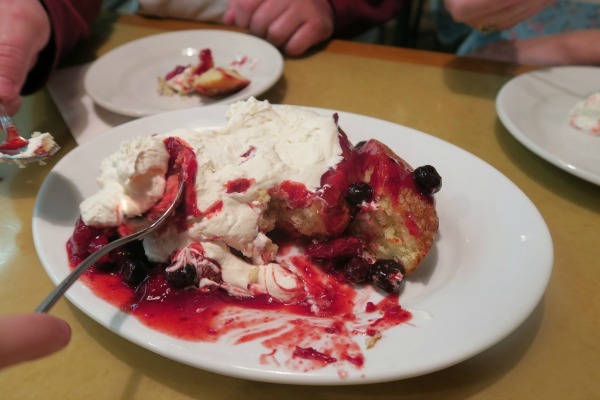 It was a vanilla cake style dessert with plenty of fresh cream and red fruits on top. So nice, that I managed to squeeze quite a lot in! 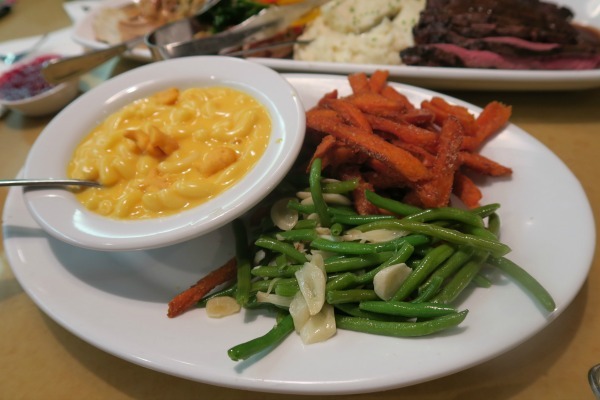 Garden Grill is one credit on the Dining Plan which makes the meal great value for money if you’re taking advantage of this. I wouldn’t say it’s worth paying our of pocket for as our bill was around $170 with a tip making it slightly cheaper than Tusker House but I’m not sure anyone could eat that amount of food to make it worth the money. It’s a great character experience though and you don’t very often see Farmer Mickey Mouse around. 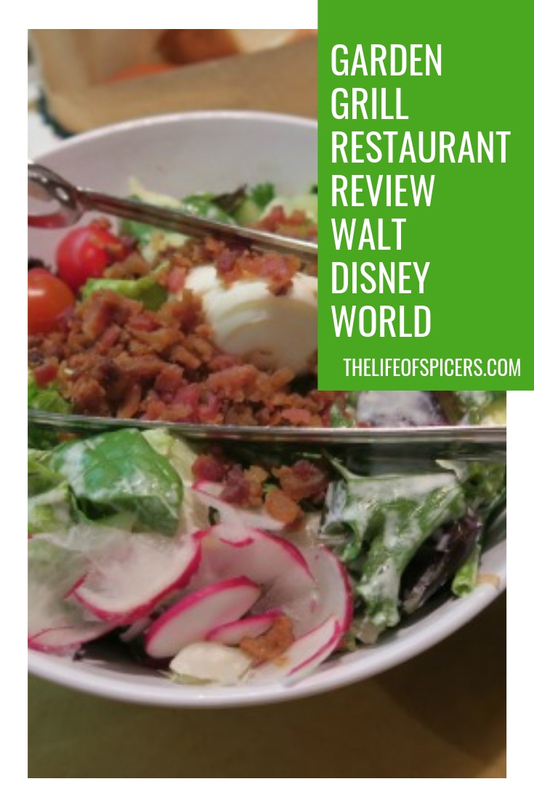 I thought Garden Grill restaurant was great and would book again on the Disney Dining Plan if we’re lucky enough to visit in the future. Comparing it to Tusker House, I think the food selection at Tusker House just tops Garden Grill, but only just.